It was a surreal birthday celebration organised by my LG (ex-LG) on Saturday. We were there at Glass House, Fish & Co. and I remembered that we were there celebrating birthday like a bit more than two years back. 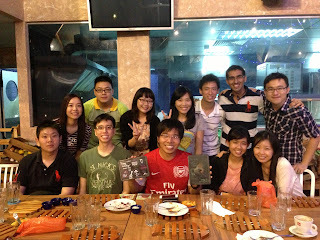 Due to restructuring, people from my ex-LG and my current LG were there. And again, the photo above is a snapshot of the people around, though it is not a comprehensive survey given that not everybody was around that day. I remember that my JC days were a breeze. Partly due to my first three months experience, I was able to breeze through my time in PJC, to the extent that my juniors were asking me how come I could get good grades despite being involved in student council and often seen slacking in the student council room and playing soccer illegally inside there. The past two weeks of lesson seemed to suggest the same thing. The amount of reading and preparation that I have done over the past three years, or even during my uni days, is proving itself useful in lesson now, that I can understand what the lessons are all about without struggling much. Perhaps it's part of the preparation that God brings us through. Taking a second look at 2012 and even further back at 2011 from a different perspective. I think I spoke my past year as if things were smooth. I have to be the first one to admit that it was not as smooth as the posts seem to suggest. In some sense, I might still be blind to what God was trying to do in my life during these two years. Not that I don’t know the overall story, but what I’m referring to points to my own personal life. The past two years proved that I have a lot to learn with regard to handling the emotions of other people. Not everything is straightforward and proceeds logically and rationally. My natural self was to think that way, but human beings are more complex than anyone knows them to be. I seriously need to get myself in touch with the emotional aspects of life. Indeed, 2012 has been a happening year, as always. On the first morning of 2013, it is perhaps apt to look back at 2012 to see what God has really brought me through over the past one year.